Nearly everyone can enjoy and benefit from a HydroMassage session. However, there are some contraindications. People with fever, severe pain, sunburn, diarrhea, open cuts, severe bruises, burns, frostbite, a skin rash and/or contagious diseases should NOT receive treatment. Patients suffering from heart or circulatory problems, thrombosis, uncontrolled high blood pressure, phlebitis, varicose veins, swollen joints, acute inflammations, certain forms of cancer, a compromised immune system, neuropathy and/or numbness should get physician approval before treatment. With HydroMassage's Water-through-Air technology, treatment pressure remains constant from the time it leaves the jets until it reaches the user. In contrast, many other Dry Hydrotherapy systems use Water-through-Water technology, which significantly reduces treatment pressure and overall therapy effectiveness. The HydroMassage features a Navitrac water release system. With computer controlled traveling jets and a pause Button, the HydroMassage gives the user the opportunity to focus treatment precisely on the area of need. In addition the track can be changed to customize your massage. Veraflex technology is the result of continuous effort to develop the most resilient and comfortable barrier between patient and water, which maximizes treatment value while keeping the patient dry. The unit is completely self-contained, eliminating any need for additional plumbing. HydroMassage Dry Hydrotherapy systems are engineered to combine the time proven therapies of whirlpool, heat and massage in a fully customizable and user-friendly system. An estimated 11 million HydroMassage treatments are performed annually, with patients ranging from chronic pain sufferers to professional athletes and celebrities worldwide. HydroMassage produces the most powerful form of Dry Hydrotherapy Systems on the market. Massage Intensity ranging from 2-32 PSI provides a level of pressure that has been tested to lift the spine, and is powerful enough to penetrate a cold pack to deliver an intense cold therapy massage for active injuries. 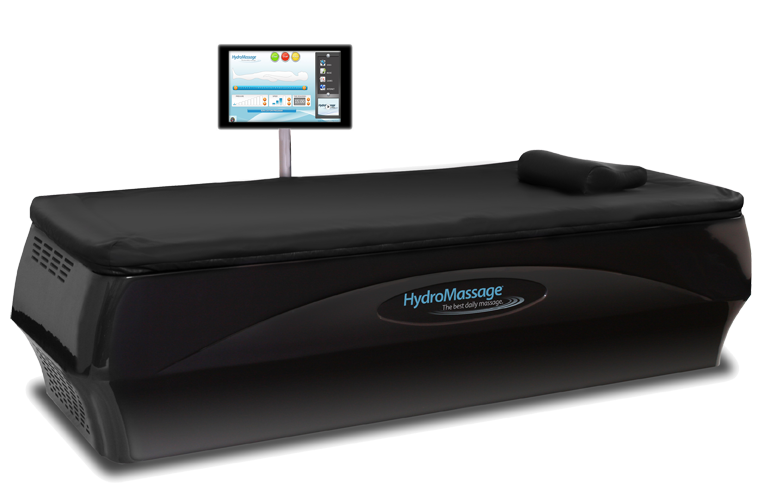 In addition to being the most powerful form of therapy, HydroMassage systems also offer the highest degree of treatment customization. Temperature, pressure, speed and treatment area are all variables that may be adjusted for each individual patient, and a pause button adds the capability to focus and hold treatment where desired. The treatment settings may be instantly recalled over the course of a prescribed treatment schedule with 36 preset programs. Users are often relieved to learn that there is no need to disrobe. We suggest you remove bulky sweaters, jackets or unnecessary layers of clothing so that you can maximize the experience. In addition, you will be asked to remove your shoes and any sharp objects from your pockets or anything else that may puncture the protective barrier. Supported by a sturdy nylon net and protected by a resilient barrier that prevents you from getting wet, you will lie on your back and be shown how to customize the speed and location of the "waves". Is the user enclosed by a cover? No. Our machine does not have a cover. Just lay down on the warm water filled mattress and you're in business! Does the user get wet? Absolutely not. They Hydromassage system is fully designed to deliver a penetrating massage while the user remains fully clothed and dry. Typically, sessions run from 15-30 min. depending on the type of relief you are seeking. In a word...Great! Hydrotherapy sessions help reduce blood pressure, increase circulation and encourage the body to release endorphins, which are your body's natural painkillers.